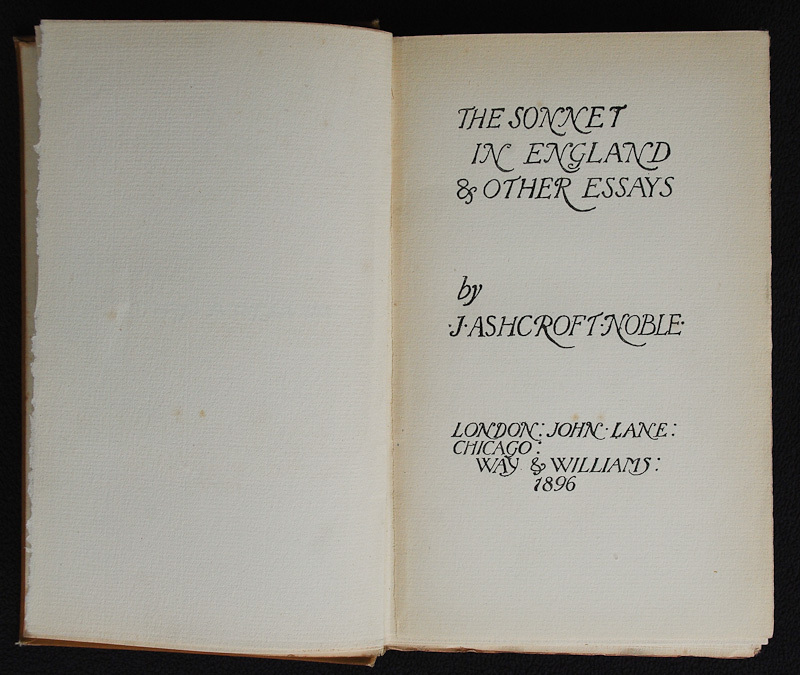 The Sonnet in England and Other Essays. John Lane, 1896. I looked forward to owning this book – assuming from the title that it was an assessment of Hawker’s writings – and since it doesn’t appear to be available elsewhere online I was initially planning to type up the complete text. It turns out that a large part of the essay is a lazy re-hash of the Sabine Baring-Gould biography, which, despite its many faults, sparkles with wit and humanity by comparison. I can’t bear to wade through all of it and anyway it’s far too long to fit here, so I’ve settled for a couple of representative extracts. ‘Had this page been printed a quarter of a century ago and been glanced at curiously by, say, a thousand people, it is safe to conjecture that 999 of them would certainly have asked ‘Who was Hawker?’ and unless they were West countrymen might possibly have added the further question, ‘Where is Morwenstow?’ During his life-time Robert Stephen Hawker might almost have been classed among the obscure: during the eighteen years which have elapsed since his death, the little group of lovers has grown into a crowd; and in the mind’s eye of every member of it the fascinatingly picturesque figure of the poet-priest is always seen standing out vividly against the wild background of iron crags which give a frontier to his Cornish sea-board parish. For the man Hawker oblivion has so far scattered her poppies in vain, and as long as he is remembered the place whose only fame is his will be familiar and beloved. He will always be Hawker of Morwenstow. The essay becomes more interesting once the biographical section is over and Noble finally turns his attention to the poetry; here are the last few pages. ‘Even had The Quest been completed it would certainly have possessed less of artistic finish than the Laureate’s Holy Grail, but, mere fragment as it is, it is infinitely richer in that fervour of feeling only generated by impassioned vision of a vividly apprehended reality. And this is a typical specimen of Hawker’s work in the field of legend. Any story which satisfied his imagination and harmonised with his faith carried its own evidence with it, and stood in no need of the gross external proof demanded by an age which knows more of historic criticism than of ‘the witness of the Spirit.’ Matthew Arnold, in many a musical wail has complained that we cannot sing such songs as were sung of old because we have lost the beliefs which possessed the older singers. Robert Stephen Hawker certainly did not labour under this disqualification. His was the hunger and thirst for the unknown an illimitable which inspired Tertullian’s celebrated certum quia impossibile est, – a saying which one feels must have been as spiritually fascinating to Hawker as it was intellectually attractive to Sir Thomas Browne. ‘In the border region – the region in which things of sense still remain, but are seen through a luminous mist of spiritual symbolism and association – Hawker was peculiarly at home. He never went on a deliberate search after hidden meanings or morals as do the mechanically-minded mystics, to whom every object in nature and in religious art is an arbitrary hieroglyph, with no fluidity of significance or multiplicity of suggestion. His mind worked instinctively; he felt before he saw; and indicated with the indescribable truth of emotion rather than with the outlined precision of thought, the unseen spiritual vesture with which things seen are clothed, and by which they are glorified. There is no more characteristic illustration of this special sensibility and activity than the sonnet entitled ‘The Vine,’ the theme of which was supplied by what was to him a never-failing source of suggestion, the church of his forty years’ ministry. Amid the carved work of the roof, a vine. Through arch and aisle. Hearken: and hear the sign. And gather from that tree a parable divine. ‘The kind of work represented here must be enjoyed for its beauty, tenderness, and spiritual fervour; but it is often somewhat lacking in healthy virility, and it is therefore needful to emphasise the statement that Hawker was essentially a manly poet. His sympathy with the ascetic life, and a cloistral tendency of imagination which, if not inborn, became at an early age habitual, never dulled the quickness of his feeling for the simpler human emotions to which, in so many of his poems he has given beautiful and adequate expression, without ever laying himself open to the charge often, and not always unjustly, brought against Wordsworth of having suffered the prosaic accidents of his subjects to overpower – so far, at least, as immediate impression was concerned – their really poetic essentials. Nor did his mystical pre-possessions ever blunt his enjoyment of the merely sensuous side of Nature; and the pleasure he derived from the sonorous break of a mighty wave upon an opposing cliff, the strong flight of a solitary sea-fowl, or the rustling of a mountain stream through a narrow valley to the sea, had as much of the flesh and blood quality which belongs to the typical sportsman, as of the more contemplative delight which is the possession of a poet with an eye for things behind this show’. 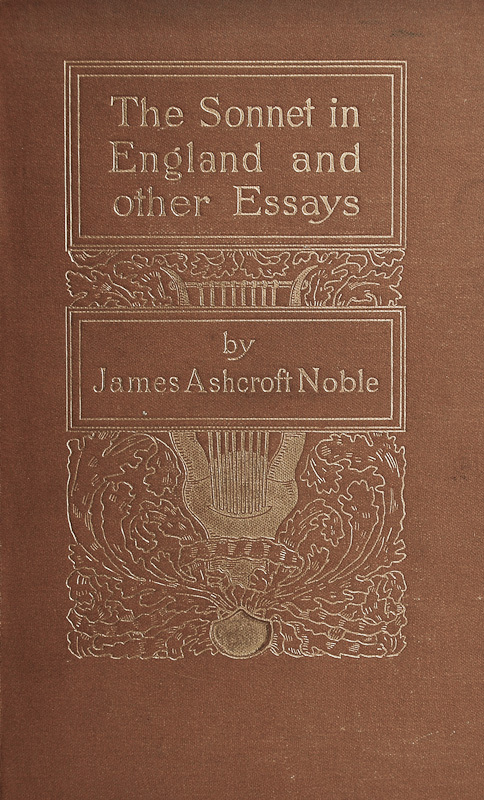 James Ashcroft Noble (1844-1896) was a journalist and poet. He spent much of his working life in the north west of England but was nationally known and widely respected as an essayist and critic. He published in The Yellow Book and helped to found the Liberal journal the New Age. He also gave encouragement to the young Edward Thomas and Thomas later married Noble’s daughter, Helen. – Kedrun Laurie has written an interesting article on Noble – the PDF file can be accessed at The Yellow Nineties Online. – Noble’s Verses of a Prose Writer, and Morality in English Fiction are available to read online at the Open Library. – Read the title essay, The Sonnet in England at the Sonnet Central website.